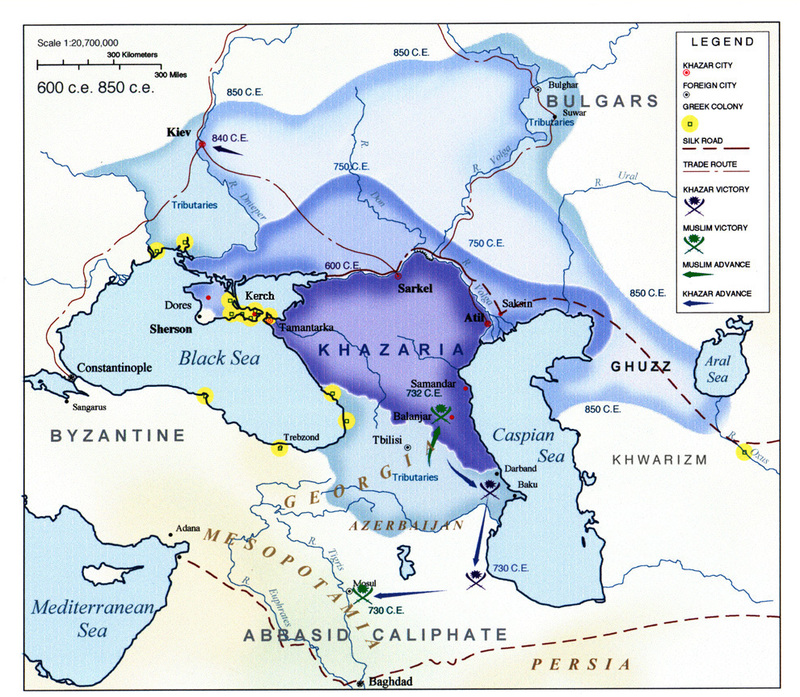 The lower Volga basin steppes between the Caspian and Black Seas were ruled by the Khazars, until the 8th century. The political power belonged to the Khagan (i.e. emperor) while the army was led by the Khagan Bek. Their political power reached its climax during the European Dark Ages and was critical for the creation of capitalism. Indeed, their strategic and commercial importance between China on one side and the Middle East and Europe on the other gave tremendous riches to most of the Eurasian states of that time. 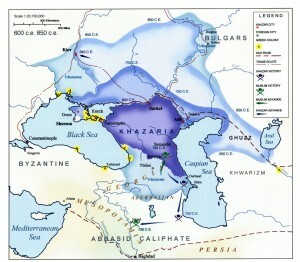 As a result, Khazars established one of the largest polities of medieval Eurasia, their territory comprising much of present-day European Russia, eastern Ukraine, western Kazakhstan, Azerbaidjan, along with large parts of the northern Caucasus and also parts of the Crimea, Georgia, and northeastern Turkey. Khazaria (or Khazar Khaganate) was known for its tolerance, cosmopolitism and fairly developed judicial system. To take just one example, its army incorporated soldiers belonging to each great monotheist religion and even pagans. It was also the main commercial link between the Baltic and the Muslim Abbasid Empire centered in Baghdad. As stated before, they were major allies of the Byzantine Empire, and won several wars against the Arab Caliphates. Between 880’s and 890’s the Volga trade route (critically important for the welfare of Khazaria – OR) ceased functioning, precipitating “the first silver crisis in Europe”. As we might expect, a period of economic depression and political upheaval followed this crisis. The arrival of Rurik to Novgorod around 860 was probably influential in the process, because he decided to shift the trade route from the Volga to the Dnieper river. Consequently, Kiev developed into an important urban centre when Rurik decided to move the capital from Novgorod to Kiev after having thrown out the Khazars, thus establishing Kievan Rus’. According to Vernadsky, the Greeks and the Khazars erected fortress of Sarkel between the Volga and the Don River to defend this strategic point from the Rus’. (Other scholars, such as Franklin and Shepard, believe that Sarkel was aimed at repelling (or at least monitoring) the Magyars and other steppe tribes, but not the Rus’.) 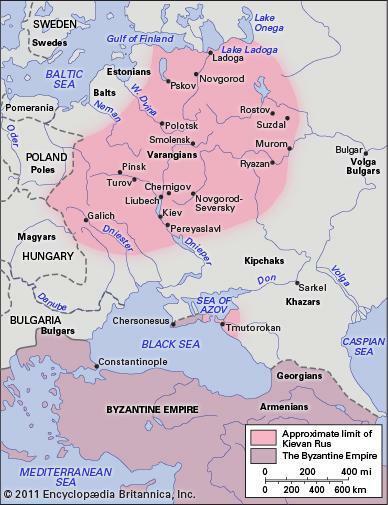 Between 965 and 969, Khazar sovereignty was eventually broken by Kievan Rus’, with the help of the Bizantine empire. The allies achieved their goal by conquering Sarkel, paving the way to a full-scale annihilation of Khazar Khaganate. In 880s, the Kievan Rus’ was officially founded by Prince (Knyaz) Oleg, who subordinated the various Eastern Slavic and Finnic tribes. By 884 he managed to subjugate the Polians, Vyatichs, Drevlians, Radimichs and Severians. In 907, Oleg led an attack against Constantinople leaving Igor, son of Rurik, in Kiev. Through a treaty, Oleg managed to impose a bribe upon Greeks, then in 911 he signed a commercial treaty with the Byzantine Empire as an equal partner. The new Kievan state prospered because it controlled the three major trade routes of Eastern Europe: the Volga trade route from the Baltic Sea to the Orient, the Dnieper trade route from the Baltic Sea to the Black Sea, and the trade route from the Khazars to the Germans. They grew also through the trade of furs and honey. Following the death of Igor in 945, his wife St. Princess Olga ruled as regent in Kiev until their son Sviatoslav reached maturity, in 963. His reign was marked by a fast expansion through the invasion of the Balkans and the conquest of the Khazars of the Pontic steppe. At the end of his life, Sviatoslav was in charge of the largest state in Europe, eventually moving his capital from Kiev to Pereyaslavets in 969, but his conquests, for the most part, were not consolidated into an empire due to fratricidal quarrels among his sons. The reigns of St. 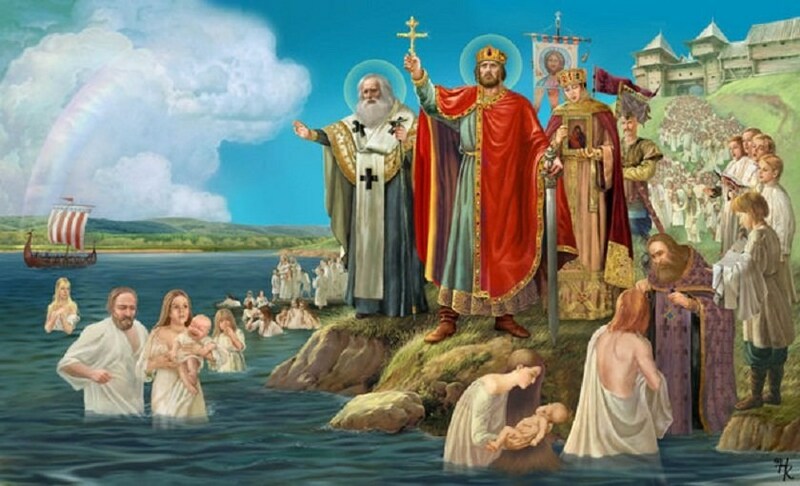 Prince Vladimir the Great (980–1015) and his son Yaroslav I the Wise (1019–1054) are regarded as the “Golden Age” of Kiev, which saw the Christianization of Rus’ (988) and the creation of the first East Slavic written legal code, the Russkaya Pravda, which means literally “Justice of Rus'”. The Christianization of Rus’ was [presumably – OR] decided because Vladimir’s emissaries in Constantinople were amazed by the beauty of the cathedral of Hagia Sophia and its liturgical service. Vladimir’s choice of Eastern Christianity was made official by his wedding with Princess Anna, the sister of the Byzantine emperor, Basil II. Besides, this choice was probably heavily influenced by Vladimir’s personal ties with Constantinople, which dominated the Black Sea and more particularly the Dnieper River, which was Kievan Rus’ main commercial route. Therefore, joining the Eastern Church had tremendous political and commercial consequences. In the meantime, the conversion to Christianity of the Eastern Slavs introduced them to science, Greek philosophy and history, without learning Greek as Hagia Sophia’s liturgy was available in Cyrillic. As a result of their independence from the Roman authority, the East Slavs developed their own literature and arts, which are pretty different from those of other Eastern Orthodox countries. Literacy was high in Kiev, Novgorod and other large cities, compared to European standards of that time. 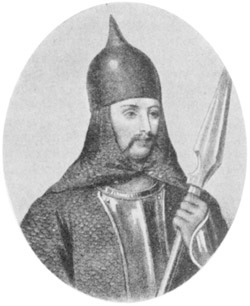 A son of Vladimir the Great, Yaroslav was vice-regent of Novgorod when his father died in 1015. In 1019, he defeated his brother Svyatopolk with the help of Novgorodians and Viking mercenaries, as Svyatopolk killed three of his other brothers to seize power in Kiev. Yaroslav looked forward to improving relations with the rest of Europe, especially the Byzantine Empire, which was also a concern for his father. He further expanded his power through arranged marriages for his sister and three daughters to the kings of France, Norway, Poland and Hungary. Yaroslav’s major achievements is the enactment of the “Russkaya Pravda”, while the construction of Saint Sophia Cathedral in Kiev and Saint Sophia Cathedral in Novgorod used to demonstrate his power to the neighboring states. Capital punishment in Kievan Rus’ was rare compared to feudal Western Europe, as the Pravda favored fines as punishment. Besides, some rights were accorded to women, such as property and inheritance rights. Therefore, the Kievan judicial system was particularly modern compared to the standards of that time. In the middle of the 11th century, the state reached its maximal power as its territory extended east to the Volga, west to the Kingdom of Poland and to the Grand Duchy of Lithuania and south to the Black Sea. Junior members of the dynasty usually began their career as rulers of a minor province, then progressed to more important principalities and finally competed for the throne of Kiev. Officials and soldiers received income and land from the princes in return for their political and military services. Merchants and artisans sometimes exercised political influence through a city assembly, the veche (council), which included all the adult males in the population. A class of tribute-paying peasants, who owed labor duty to the princes existed but there was not a widespread serfdom system, which was a major feature of medieval Western Europe. The state declined in the late 11th, following the death of Yaroslav, and imploded in the 12th century to leave the land unruled because of the emergence of several regional powers due to this collapse. A major cause has been the nature of the political system itself: the power was transferred not from father to son, but to the eldest member of the ruling dynasty. Of course it entailed rivalry and hatred within the royal family. Three of Yaroslav’s sons fought each other after their defeat at the Battle of the Alta River against the Cumans (1068) while an unrest took place in Kiev, bringing to power Vseslav of Polotsk. The Kievan Rus in the 11th century. In 1097, Vladimir II Monomakh organized the first federal council of Kievan Rus in Liubech , in order to reach an agreement among the various fighting sides. The last ruler to maintain a relative unity within the state was Mstislav the Great. After his death in 1132, the Kievan Rus fell into decline and his successor struggled with the growing power of the Novgorod Republic. Then in 1169, Andrey Bogolyubsky of Vladimir-Suzdal’ sacked Kiev and by the end of the 12th century the Kievan state became even further fragmented. After this, the state was further weakened by the collapse of Rus’ commercial ties to Constantinople due to the Crusades, which made the Dnieper a marginal as a result of the destruction of Constantinople by the christians. More precisely, the trade route between the Black Sea and the Baltic Sea was the backbone of Kiev’s economy as it served as the main trade route between the Varangians and the Greeks, and the Black Sea was controlled by Constantinople at that time. Thereby, once the Byzantine Empire collapsed, trade on this route plummeted and Kiev lost its appeal as a result. In the north, the Republic of Novgorod prospered as part of the Hanseatic League, the first international trading confederation in history. The city’s oligarchy controlled trade routes from the River Volga to the Baltic Sea and as Kievan Rus’ declined, it became more independent (but continued to be part of Kievan Rus’). An interesting feature in the development of Novgorod is that although it was ruled by a local oligarchy, a republican government existed there because major political decisions had to be made by a town assembly, which also elected a prince as the city’s military leader. It is possible that there was also a kind of “Council of Lords” that was headed by the archbishop but its actual power remains unclear today and he was elected by Novgorodians anyway. Its economy was mainly based on salt and furs, with the lands located north of the city being critical in that regard. Indeed, they supplied most of the above mentioned items and Novgorod had to defend them against Moscow in the late 14th century. The victory of Moscow brought about the decline of Novgorod and boosted Moscow’s development until it became the heart of Russia. In the northeast, Slavs from the Kievan area colonized the territory that would become the Grand Duchy of Moscow. 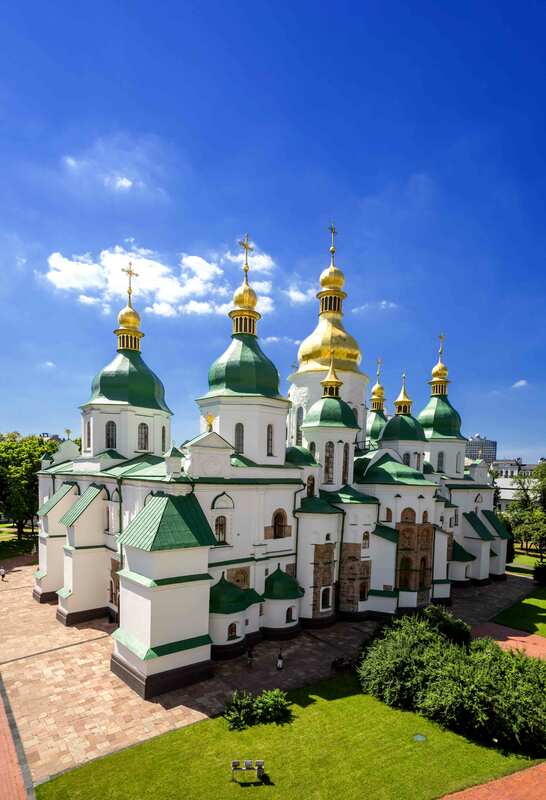 Rostov, which was the oldest centre of this region has been overtaken first by Suzdal and then by the city of Vladimir, which became the capital of Vladimir-Suzdal’, a principality which would assert itself as a major power in Kievan Rus’ in the late 12th century. Very interesting history of Russia. I enjoy history as if offers great insights into the past and learning lessons for future generations. Unfortunately history is easily forgotten because mankind looks more towards the future.